Welcome to Maelorum, we've been expecting you! Maelorum will return with the launch of Volume Two. People ask me all the time, "What is this about?" Maelorum is a Dark Fantasy novel, but interactive where you can have multiple endings. It is unlike anything that has come before. More story, more choices, more illustrations, a true top quality product. What is it about? It's really about you, and who you choose to become in Maelorum. 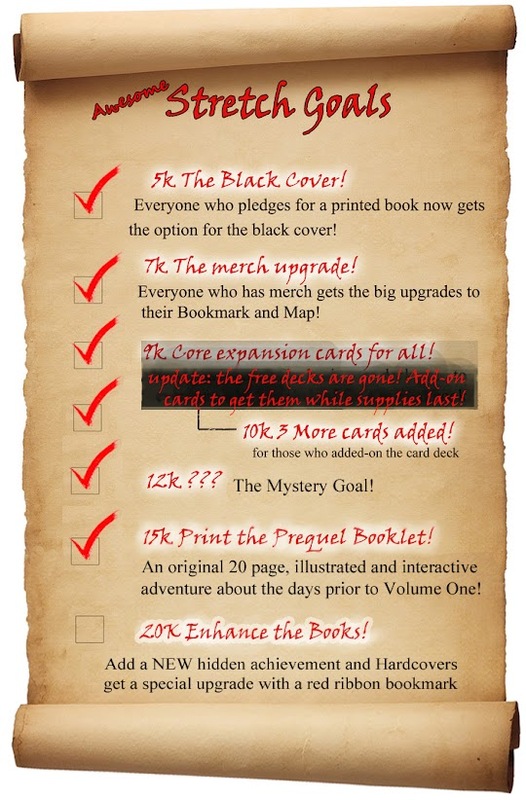 Maelorum is a completed book, and this is a new project solely seeking your help so we can order and print a new batch of revised first editions, now with a new special black edition cover! Notes: Over 60 hand drawn illustrations, 40 of which are printed in FULL COLOR. The book is 440 pages long, and includes instructions, and a ten page item list in the back full of treasure you'll find while exploring. It is printed in 8.5 x 5.5 format with 60# high quality paper and available in a perfect bound softcover OR gloss-coated Hardcover. Choose one of three main characters to explore Maelorum as. Unlock hidden achievements, and battle over ten hand-drawn creatures. You control the story. Your decisions will determine how the story ends, will you be a hero or a villain? With random events, and limitless choices, no two read-throughs are the same! Over ten Unique endings! "In a world that has forgotten about magic and monsters, three adventurers will face an ancient nemesis, in a place where forgotten things return." 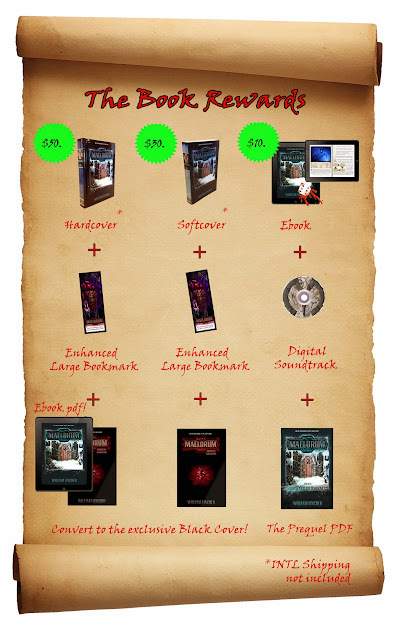 In Maelorum the Gamebook genre is reborn into a new and exciting format. Choose one of three main characters, and begin an adventure that will take you from rolling green hills to the deepest Underworld, and perhaps the darkest depths of Human nature. This is an interactive fantasy novel, where you actually determine the outcome of the story based on your decisions throughout the game. Many people are familiar with Fighting Fantasy, or LoneWolf. Maelorum can be compared to these types of books, except that I have taken it in a darker and new direction, with full color illustrations and an epic story arc. You will never read the same story twice! "HOLY. CRAP. Will... my books arrived a couple of days ago... the word "epic" only begins scratching the surface." "Your book is the best adventure gamebook I've ever EVER read... And the package was better than perfect... this is my first "received" Kickstarter, and it's a very good one, I'm really glad I helped making it real." "I just got Maelorum a day or two ago and just about every second of my free time has been invested in it since. I'm not going to make any definite judgment yet, but this may be one of the best adventures I've seen in a gamebook yet." "first impressions leave me impressed. The paper quality, the production values, the colour illustrations, the sheer amount of text... It truly is a labour of love." "Got my book a week ago or so. To be honest I was really surprised (positively) about the amount of content in it! It'll take me a while to actually have enough time to complete it with my current work load, but I'm really happy already with it. Thanks for a great product Will!" "Received mine over here in Singapore last Friday. Perfect and what a beautiful book it is!" Funds go towards ordering the books from the book printer, and postage for shipping. Other funds will cover the costs to produce the new merchandise. That's it. If I get extra funds, I'll start throwing in more rewards. I'll detail plans for stretch funds in the coming weeks. 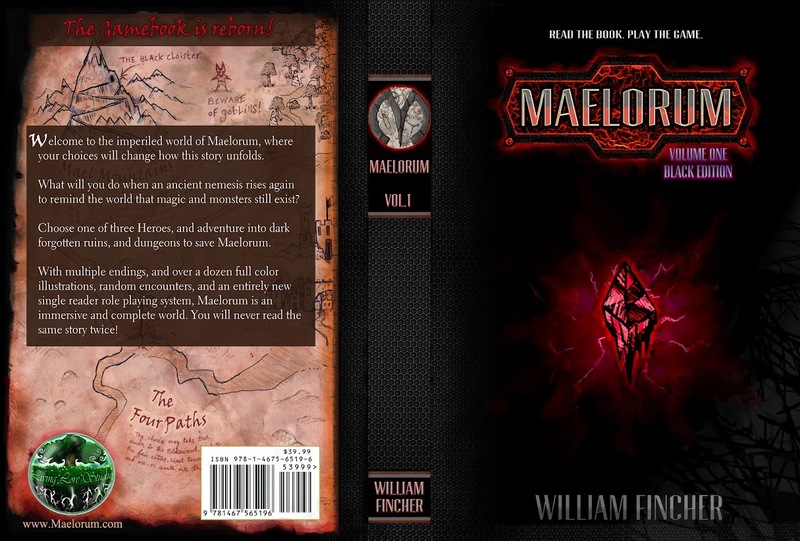 William Fincher is the Author and illustrator of Maelorum, an epic fantasy gamebook that seeks to keep the gamebook genre alive by creating new interest in the genre. He currently resides in Southern California with his Wife and Son. Other works include "The Revenant" and several more upcoming projects, including Maelorum, Volume Two. Thanks to Arnold Nesis for composing the soundtrack, and Diogio Leitão for the video trailer. This is not my first Kickstarter, and I have learned incredibly valuable lessons on how to create and fulfill project rewards. From what I know, shipping will continue to be the hardest part, but I have a system in place from my last project that has worked well so far. I will tell you that some overseas shipping carries some risk as a couple of my existing backers know, overseas shipping is subject to delays, or worst case a lost package. HOWEVER I will upgrade shipping from USPS priority mail to whatever you want if you add funds. Otherwise I have already included shipping fees in the reward. Add your name to the book! There's a list of backers nicely presented in the back of the book, include your own name starting with this tier. This is included automatically in all the higher reward tiers. The New Dice and New Bookmark! One of the new hand-painted monster turn dice, and the new illustrated bookmark only available here. The Ebook combo! Maelorum in PDF format, and the Original Soundtrack download! Awesome on iPad and PC! The Maelorum cards! The full expansion deck which accumulates cards as we hit stretch goals. The cards will be compatible with both first and second printings of Maelorum. Domestic shipping included, overseas add $10.00 shipping. The Prequel Booklet! 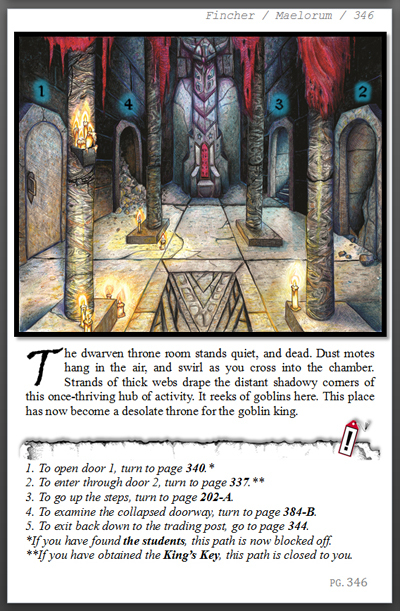 (15.00+ 5.00 shipping) This is a stand alone purchase of the 20+page, illustrated mini-quest booklet which will be printed to match Volume One. All the New Merch! A large, folding map of Lordell City, a new exclusive custom bookmark only available here, and one of the new hand painted Monster Roll dice. Softcover (USA Shipping). One signed first edition perfect-bound copy of Maelorum, Volume One, plus an illustrated Maelorum bookmark, shipped anywhere in the USA. Philanthropist. Please donate a book to any school here in the USA. Keep kids reading, and give them a chance to learn about Gamebooks! Hardcover (USA Shipping) One signed collector's hardcover first edition copy of Maelorum, plus an illustrated bookmark, shipped anywhere in the USA. Softcover (INTL Shipping) One signed first edition perfect-bound copy of Maelorum, Volume One, plus an illustrated Maelorum bookmark, shipped anywhere in the world. One signed Hardcover copy, A large, oversized bookmark, the Ebook, and HALF-OFF shipping! Hardcover (INTL Shipping) One signed first collector's hardcover first edition copy of Maelorum, Volume One, plus an illustrated Maelorum bookmark, shipped anywhere in the world. The Treasure Chest! 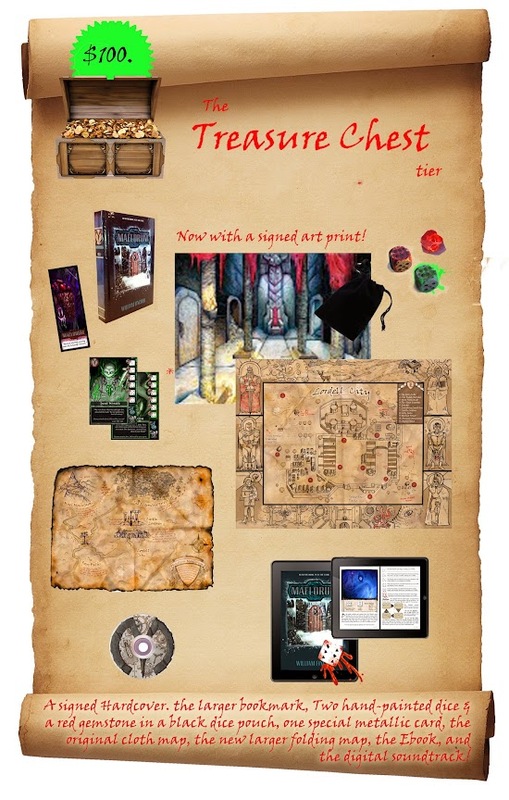 One signed collector's hardcover first edition copy of Maelorum, and all the new merch, plus an original combat die and an original Maelorum map, shipped anywhere in the world. The Treasure Chest II. What lies within the chest? Only when the backers unlock it, shall it's contents be displayed on the home page. Patron of the Arts! Take your pick of any original card art I've drawn for this project, and it comes with a free signed perfect-bound softcover! Blackmoor's Hoard! A custom reward tier. 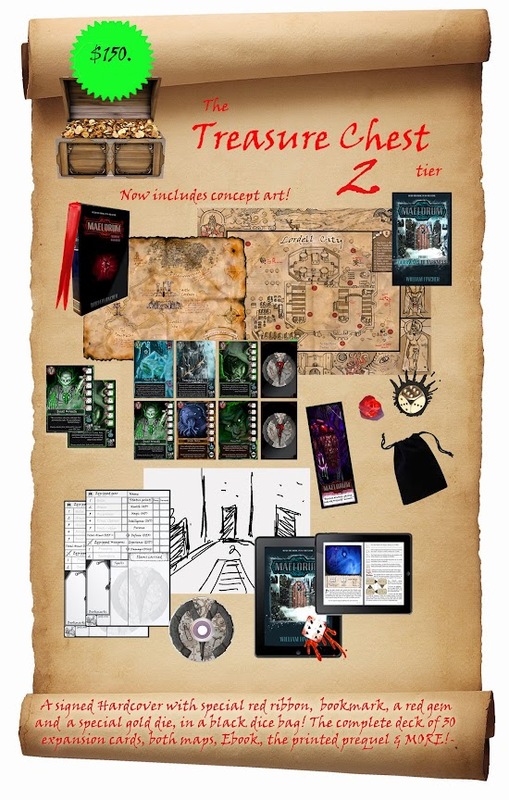 2x Treasure Chest Rewards, 4x All-New Merch Rewards, 5x Softcovers, 1x Additional Hardcover, 2x Original Art Prints, 2x Original Cloth Maps, and Original Bookmarks. You'll also be added into the Sequel in a big way!